Suitable for leasing large industrial plant and or machinery to another business. Not suitable for lease to a consumer as it does not comply with necessary consumer protection legislation. 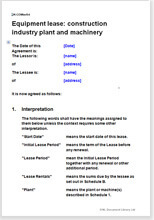 Lease term can be fixed or extendable.